Turrialba Volcano was named after the region of in which the volcano is situated in Turrialba County, Cartago of Costa Rica. There is no clear consensus on the origin of the name Turrialba, but historians disagree with attempts to attribute the name to the patronym Torrealba (from in Spain) or from the Latin Turris alba (white tower). The general consensus is that Turrialba derives from a local Indian language (Huetar) but there is no agreement on its actual roots. The stratovolcano is 3,340 m (10,958 ft) high and is about 45 minutes from the Atlantic slope town of . The summit has three craters, one of which has fumaroles and sulfur pits. Visitors used to be able to hike down into the main crater, but increased gaseous activity has caused the time at the summit to be limited to no more than fifteen minutes. The hike to the top from where the vans usually are forced to stop takes about one to three hours depending on the ability of the hikers. Below the summit is a mountain range and cloud forest, with ferns, bromeliads, lichens and mosses. During the 19th century, it explosively erupted several times (1847, 1853, 1855, 1861, 1864-1865, 1866), producing pyroclastic flows. 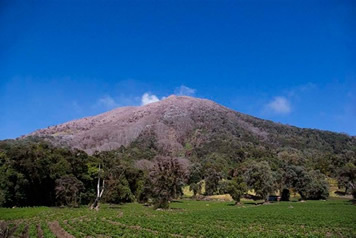 The last major eruption was in 1856, but in January 2001, the volcano reported increased activity, displaying strong fumaroles at the central craters. The volcanic activities have increased since January 2010, the volcano emitted ash, and two villages, and El Retiro, were evacuated. Turrialba is adjacent to Irazú and both are among 's largest volcanoes. It had at least five large explosive eruptions in last 3500 years.